Just a little progress on For Fate that I thought I’d share. I name this post “recent” Ludum Dares, but honestly I haven’t really posted anything about any of my entries for over a year. Anyway, I wanted to give an update, but I don’t have enough cool stuff on new projects yet to show, so I thought I’d step back and post about recent Ludum Dare entries! To start out, if you don’t know what Ludum Dare is, it’s a competition where you’re given 48 hours over a weekend (or 72 hours if you choose to do the separate jam, rather than the compo) to make a game from scratch. In the competition, everything has to be created by you, with the exception of open source engines and such. So art, music, sound, and code has to be created within that 48 hours. It happens about 3 times a year, and is a ton of fun, so if you’re into game programming, I highly suggest you check it out. I’m just going to give quick posts for my latest 3 of the 4 of my latest entries, from oldest to newest. My latest entry will get its own post. To start out, my Ludum Dare 23 entry was Faelanax. 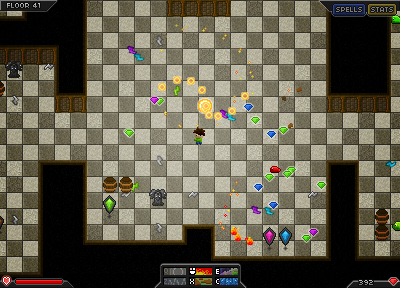 It was a top down dungeon crawler with an action battle system. The goal, like many dungeon crawlers, is to crawl as deep into the dungeon as you can. As you defeat monsters, you collect gems you use to upgrade your 6 spells, and you use those 6 spells to help you defeat any monsters that stand in your way. 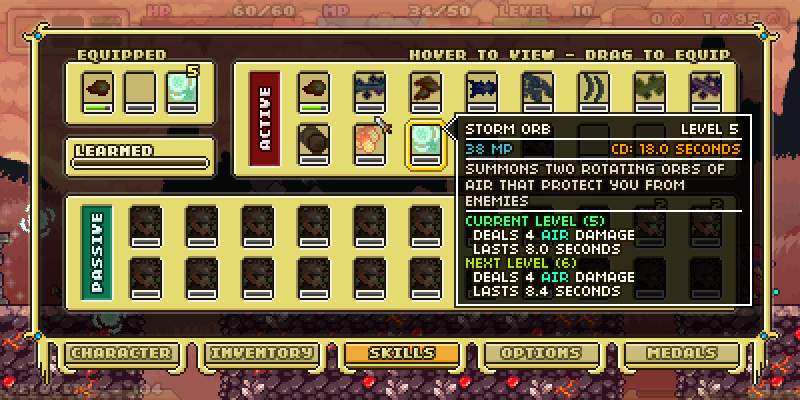 It has a full item system where you’ll find items from enemies and chests with randomized stats that you can equip. The graphics were iffy at best, but attempting to get as far down as possible while trying to upgrade your gear made for some cliche fun. It wasn’t original by any stretch, but I still thought it was pretty fun. After the competition, I actually spent quite a bit of time adding bosses, fixing things up, polishing it, and making it more fun. I added more monsters using REFMAP graphics, and even got someone to make me some more tilesets. Unfortunately I still haven’t released it, but hopefully I’ll get around to it at some point. I might port it from Flixel to Axel in order to be able to release it on Ouya also. 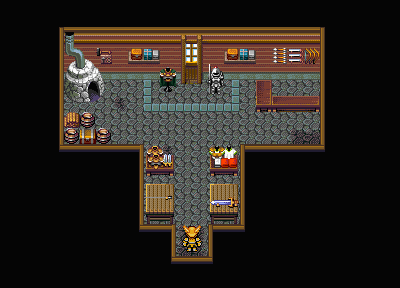 The Legend of Elzad is another game that I never got around to releasing. The game is a game very similar to the older Zelda games like A Link To The Past. You take the role of a character who is attempting to save the land. 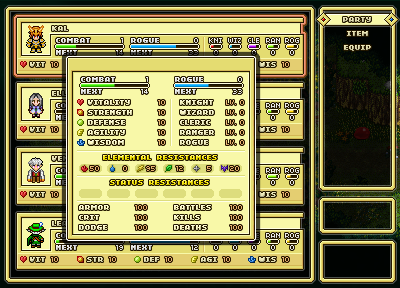 As you progress you’ll find different items, upgrades to your armor, and other tools to help you on your quest. The game is relatively straight forward, takes place entirely on the overworld, and doesn’t have much of an ending. 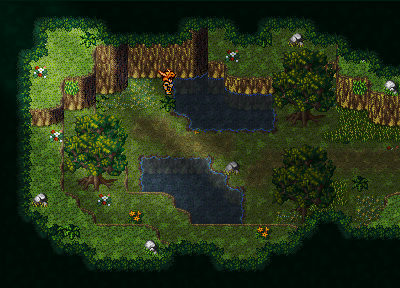 The original plan was to have a couple of dungeons with puzzles that you also have to explore. Unfortunately due to time I was unable to get these other features in. The main reason that I never got around to releasing it is that because it doesn’t feel quite like a full game, it would have taken a lot of work in order to bring it up to speed to be something that I could actually release as a “game”. From the black was my first chance to make a space shooter. I originally wanted to make a scrolling shoot ‘em up, but ended up going with a kind of geometry wars-like twin stick shooter. The theme was “You are the villain”, which gave me the idea to create a game where you appear to be the hero until the end. Ended up being kind of a depressing ending, but it all worked out. Anyway, that’s a summary of my Ludum Dare 23, 24, and 25 entries. Soon I’ll have a post detailing my Ludum Dare 26 entry, and then I can get back to posting about things I’m working on! Going to be changing the blog’s theme to something simpler. Hang in there if things get a bit crazy. Insert obligatory introduction paragraph about how I need to post more on the blog. Proceed to rarely post. Now that that’s over, I thought I’d post some updates showing some of the progress made on For Fate. I haven’t been able to work on it much, and probably won’t be able to work on it much soon, but progress is progress. 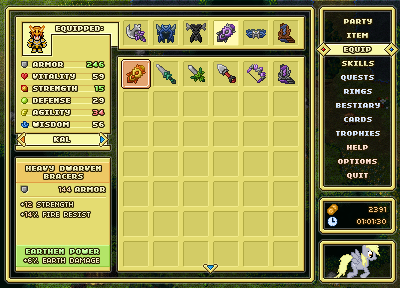 Some initial work on the inventory system. With a pony. Of course. 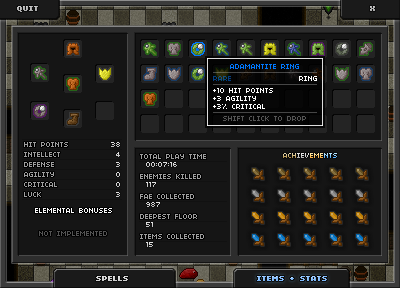 Work on the stats and party section of the menu. 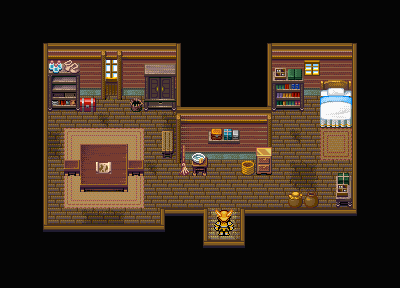 There’s still a million things left to do, but my general order of things right now is get enough content (maps) and then start working on tying it all together. For those still waiting for news about Diamond Hollow III, I’ve started thinking about it, making decisions about some of the higher level things (how the weapon/upgrades will work, how the maps will work, etc. I’ve think I’ve settled on going with a more traditional metroidvania style map system (exploring linked rooms, etc) in a full 2d world, rather than sticking with the traditional climbing up. It’s a different direction than the previous 2 DH’s, but it will allow me to do more cool stuff that I couldn’t do before. However, it’s still in the early planning stages, so I probably won’t have anything cool to show for awhile. But don’t worry, Silo will be back, and he’s got his heart set on saving SAGA. I’ve been meaning to create an iOS app for a long time, in order to gain the experience of the whole process. Once it became easy to export flash games to an iOS app via Adobe AIR, I didn’t really have an excuse anymore. Because of this, I’ve finally gotten around to releasing Glissade. 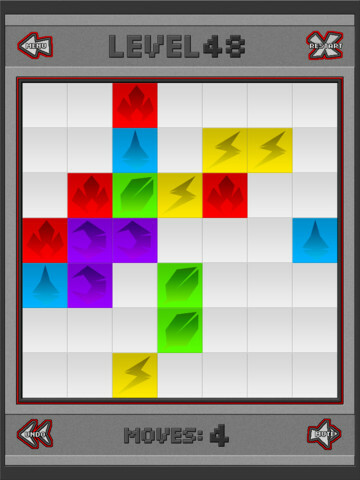 Glissade is a puzzle game where the goal is to clear the board of all tiles in a limited number of moves. 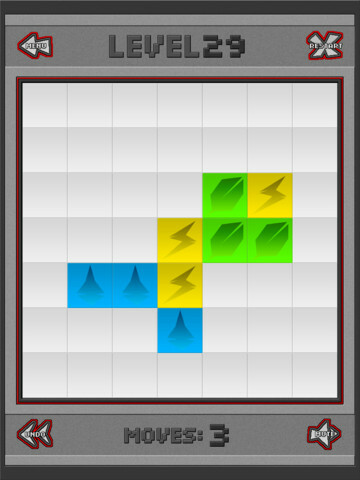 Originally it started as a flash game, but I felt that it would make great use of a touch screen (and I really wanted experience with making and releasing an iOS app), so I ported it to Axel and released it on the app store. On the other end of things, I’ve been getting a lot done with For Fate lately, especially on designing and figuring out the menu system. Hopefully I’ll have some updates for you soon. In other news, Ludum Dare 23 and Diablo III ate up the last 2 months. I created Faelanx for LD23, and after the competition I put a little bit of time into improving it. Unfortunately, I didn’t finish (and I’m still waiting on some art) because then Diablo 3 was released and that ate up until now. I’ve slowly started migrating back into more productive things. 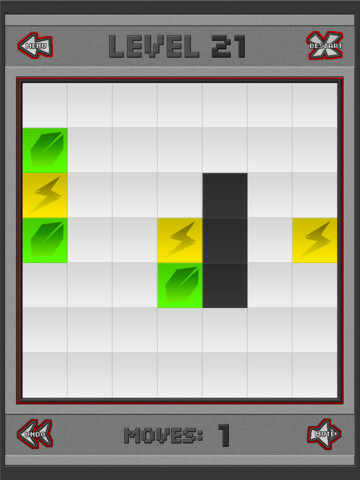 Right now I’m working on version 0.9.2 of Axel, and after that I can get back to working on a game. I’ll need to finish some small things in the post-compo version of Faelanx first and release that. But afterwards, I haven’t quite decided what I want to work on (probably For Fate or DH3), so we’ll see. Hopefully once I do I can start posting more often with cool progress updates. Anyway, just wanted to show I didn’t die. Yet. Axel is an open source library that makes flash game development as easy as possible. Axel takes advantage of Flash Player 11′s Stage3D in order to offload all the rendering to the GPU in order to gain huge performance boosts over the typical flash display list. As of Adobe Air 3.2, Stage3D is also supported when building your games for mobile devices. This means exporting your flash games to iOS and Android has never been easier! Axel was created to be great for making games quickly, with all the basic game logic solved for you already. Sprites, physics, collision, tilemaps, and particles are just some of the things provided for you. 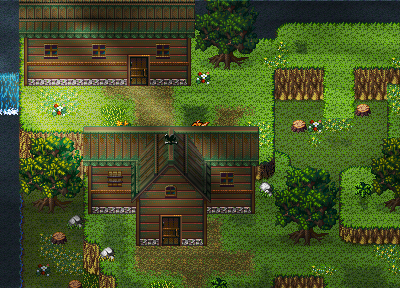 Axel was heavily inspired by Flixel, so if you’re familiar with Flixel, you’ll be able to jump right in. Axel is well documented, with comprehensive tutorials and open source example games for you to learn from. Check out Axel at http://axgl.org! It’s complete open source and released under the MIT license, so feel free to browse the source on Github! Axel development is extremely new and still in the testing phases, so you’ll be one of the first to test and help shape a brand new library! I didn’t get any work done on For Fate this weekend, since I spent every working moment working on a prototype for a Stage3D hardware accelerated flixel-like game library. 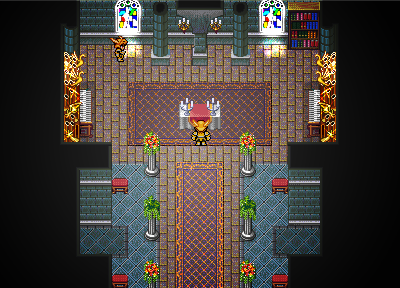 However, since I haven’t posted in awhile, I thought I’d post a screenshot of the temple. Want updates on games I’m currently working on? Follow me on twitter! I often post updates and screenshots of things I’m working on before I post here (and sometimes I don’t update here), simply because it’s a much quicker and more casual environment. It’s a nice place for me to talk about things as I’m working on them, without having to go through the hassle of a blog post.